Charter a private jet to Van Nuys, home of the world’s busiest general aviation airport. (VNY) Van Nuys Airport is within the city limits of Los Angeles, and the increased privacy and comfort offered here make it a popular choice for celebrities and business people flying private to the Los Angeles area. Los Angeles Private Jets believes in providing private flyers with a one-on-one consultative service experience that exceeds every expectation. We understand that your time, privacy, flight preferences and most of all, safety, are all extremely important. Our team of private aviation experts go the extra nautical mile to arrange the right aircraft and flight itinerary that best suit your needs. Our Van Nuys Private Jet Charter representatives are available for you by phone and email 24 hours a day, 7 days a week. When using our private aviation service, you can expect quick response times and an easy, hassle-free booking process. Request a quote or call us to arrange your private flight to Van Nuys, California. Van Nuys is a neighborhood located in the San Fernando Valley just west of Burbank and North Hollywood, giving it close proximity to some of the most lavish, upscale hotels in the Los Angeles area. There are several five-star rooms available to the south in Beverley Hills, where you’ll find luxury accommodations at places such as L’Ermitage, Montage and Peninsula. Continue south towards the Pacific coast and you’ll be within check-in distance of the Shangri-La and Viceroy in Santa Monica, and The Ritz-Carlton is scattered throughout the area, with locations in Marina del Rey, downtown Los Angeles, Laguna Beach and Rancho Mirage. Foodies will want to book a room at The W Los Angeles Westwood, a boutique hotel featuring not one, but two restaurants by celebrity chef Gordon Ramsey. The top choices listed below are based on factors such as Van Nuys Private Jets passenger feedback, location, amenities and online reviews. Once you charter flight arrives at (VNY) Van Nuys Airport, our Los Angeles Private Jets representatives can also arrange ground transportation to/from the hotel of your choice. 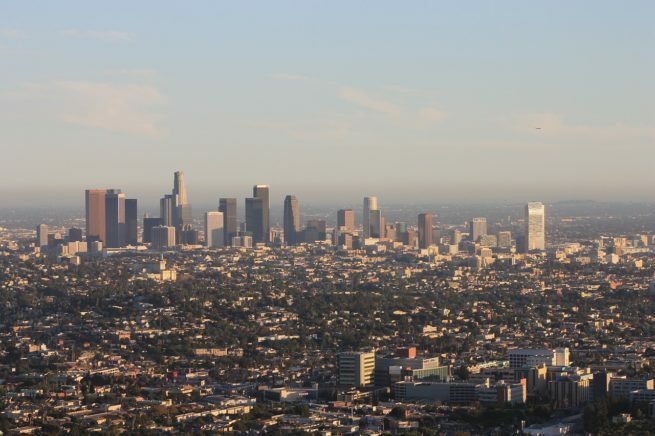 While the majority of Van Nuys is quaint city, it’s location in the middle of “The Valley” right outside of downtown Los Angeles make it a premier destinations for private charter flights into Los Angles County. After your private flight arrives in Van Nuys, you’ll find yourself close to many of Los Angeles’ best attractions. After landing at Van Nuys, start in Beverley Hills, home to some of the most wealthy residents of Los Angeles, and a high-end shoppers paradise. If carrying all those bags makes you a little hungry, don’t miss Urasawa on Rodeo Drive, an intimate, luxurious restaurant with dishes crafted by renowned Japanese chef Hiro Urasawaa. From there you can make your way over the Hollywood Boulevard and stroll long the “Walk of Fame”. Catch a selfie with your favorite celebrity’s star while you’re here, or sink your hands and feet into impressions left by celebrities such as Clint Eastwood and Rita Hayworth at the TLC Chinese Theater, formerly known (and often still referred to) as Grauman’s Chinese Theatre. If you’re flying to family to southern California for a leisurely visit, you can take the I-5 southeast to Disneyland, located in the city of Anaheim in Orange County. Families looking to spend some time at the parks can stay at Disneyland’s Grand Californian Hotel & Spa, an upscale hotel with an arts-and-crafts theme and convenient access to Disney California Adventure and Downtown Disney. You can also check out Knott’s Berry Farm, another popular theme park located just 8 miles away in nearby Buena Park. Van Nuys Jet Charter is also very familiar with the flight preferences of celebrities, athletes, musicians and entertainers of every variety. We cater to several high-profile clients with needs and preferences outside of standard flight requirements, and are able to satisfy even the most demanding private flyers. If you’re an agent or personal assistant and need to arrange a private flight for your client to/from Van Nuys Airport, let us be your personal assistant in private aviation. Our team understands that this business is about forming a relationship, and not just about the dollars and cents. We’re happy to answer any aviation questions you may have, and provide a transparent, one-on-one consultative experience to give you peace of mind when arranging your next fight to Van Nuys. We work as hard as we can to make the quotes we offer competitive and fair. Our team diligently reviews the most recent reports for pilot safety, aircraft maintenance and operator history, and we never cut corners regarding our clients privacy, safety, and comfort. You might not book with us the first time, but once you do, you’ll know you have a private aviation company you can work with for every flight you need going forward. Business professionals flying private to Van Nuys can also benefit from the level of service we provide. The private aircraft we use for flight to Van Nuys are operated by FAR Part 135 or 121 air carriers and our company is Wyvern certified, meeting the same strict safety levels many Fortune 50 companies apply to their fleets of corporate jets. Van Nuys Airport is a premier destination for media personnel, along with executives in the high-tech, transportation and oil & gas industries. If your business plans require a corporate charter flight, let us arrange the right aircraft and itinerary that best suits your trip, taking the hassle and stress away so your team can focus on your business. If you have a corporate fleet and one of your jets has suffered a mechanical problems, we can arrange a supplemental lift in as little as 4 to 6 hours. We can also arrange supplemental charter flights out of Van Nuys for jet card and fractional jet owners; our team offers unlimited quotes, so call and compare us to your current plan before reserving hours for your next flight. Check out some of our recommendations below for things to do after your private flight to Van Nuys, California. When arranging your private flight to Van Nuys with Los Angeles Private Jets, you’ll enjoy access to thousands of private jets based in Los Angeles and across the United States. All of the planes we arranging for charter flights are operated by FAR Part 135 (or foreign equivalent) air carriers. CHeck out our aircraft list below. Los Angeles Private Jets utilizes the following airport to fly clients privately to/from Van Nuys and neighboring areas of Los Angeles, California. Request a Quote or give us a call at 1-888-987-5387 to speak with one of our Van Nuys Private Jets agents for your next luxury vacation, business trip, or special event.